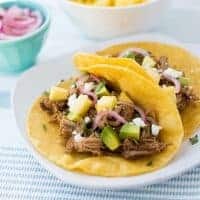 Slow-Cooker Pineapple Chipotle Pork Tacos– simple to make in the crockpot, and full of amazing flavor! Make sure the chipotles in adobo sauce are gluten-free. They are found in a can on the Mexican food aisle. I add 1 adobo pepper and it isn’t very spicy, just flavorful. You can add 2 if you really like the heat! For the pork: Combine the salt, pepper, cumin, chili powder, and cinnamon in a small bowl. Pat the pork dry and rub the spice mixture evenly over the pork tenderloins. Heat the oil over medium high heat in a large skillet. Add the pork and brown on all sides, 4-5 minutes per side. Transfer the pork to the slow cooker. In the now empty hot pan, add the chicken stock and scrape up the brown bits on the bottom of the pan. Pour into a blender. Add the remaining ingredients for the sauce to the blender and blend until smooth. Pour over the pork and cook on low for 4-6 hours. Shred the meat and mix with the sauce. Add a little more sugar if it tastes bitter and salt to taste if needed. Enjoy! *For the pickled onions: Combine 1/4 cup red wine vinegar, 1 tablespoon sugar, 1 1/2 teaspoons salt, and 1/2 cup water in a small bowl and stir until dissolved. You can heat this mixture slightly on the stove or in the microwave to combine it thoroughly. Add 1/2 cup thinly sliced onions and let sit at room temperature for at least 30 minutes or for a few hours in the fridge. Drain onions before serving. Chill leftovers in the fridge for up to 2 weeks.